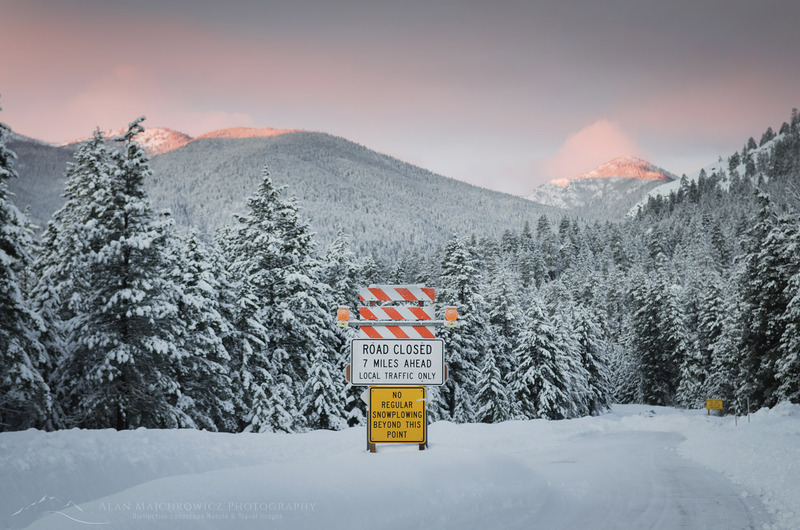 Last week I made a trip to Manning Provincial Park for winter photography and skiing fun. Weather forecasts were for cold temperatures and a good amount of fresh snow. Perfect conditions to make some new winter photos. Manning Provincial Park is a large park in southern British Columbia. 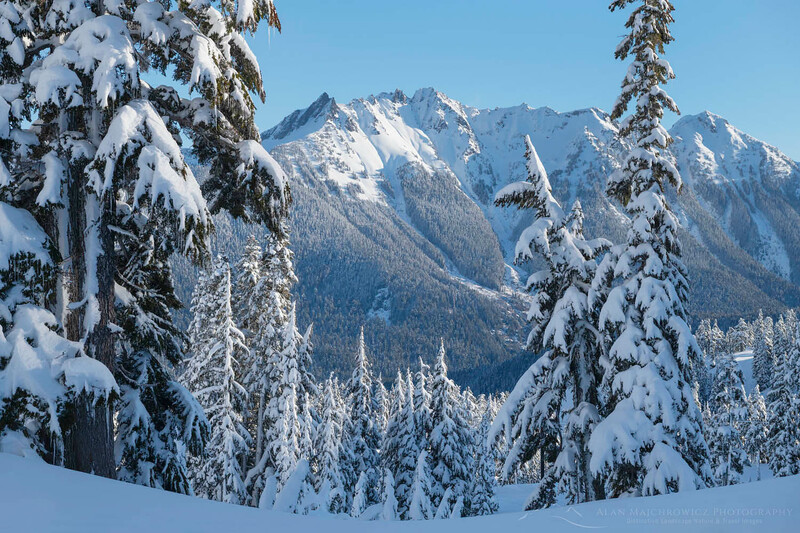 It encompasses the northern reaches of the North Cascades Mountains, along the U.S. Washington State border. On the U.S. side the mountains present a rugged appearance with high jagged peaks. 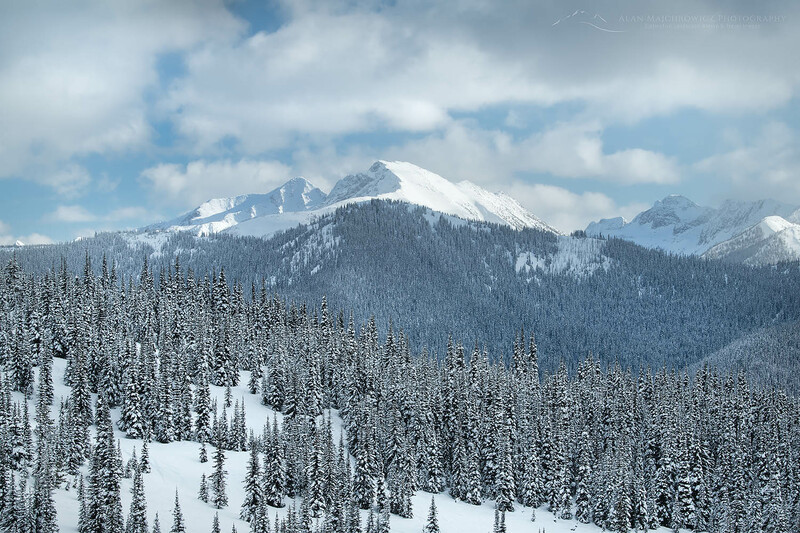 However, in Manning Park the range mellows out into high mountains with more rounded summits. Just north of the park the North Cascades ends, and gives way to the Thompson Plateau. In summer hikers in Manning Park can find some great trails offering high views and meadows of wildflowers. 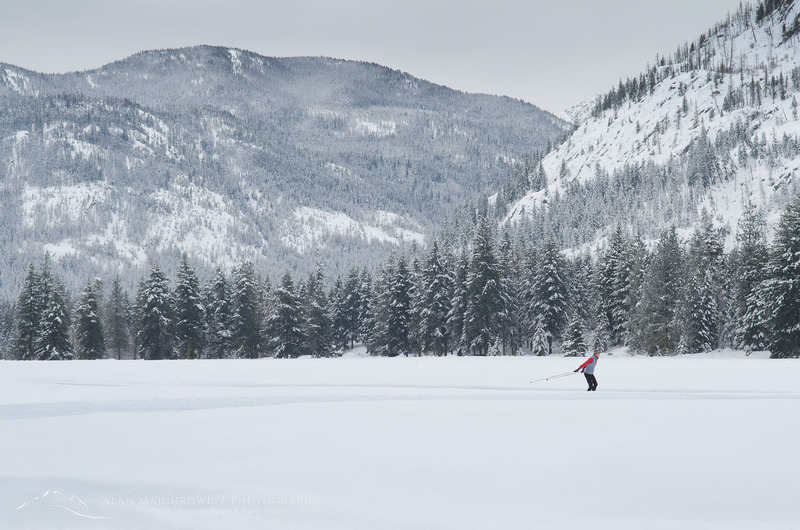 In winter the park offers a network of cross country ski trails in addition to the small Gibson Pass downhill ski area. 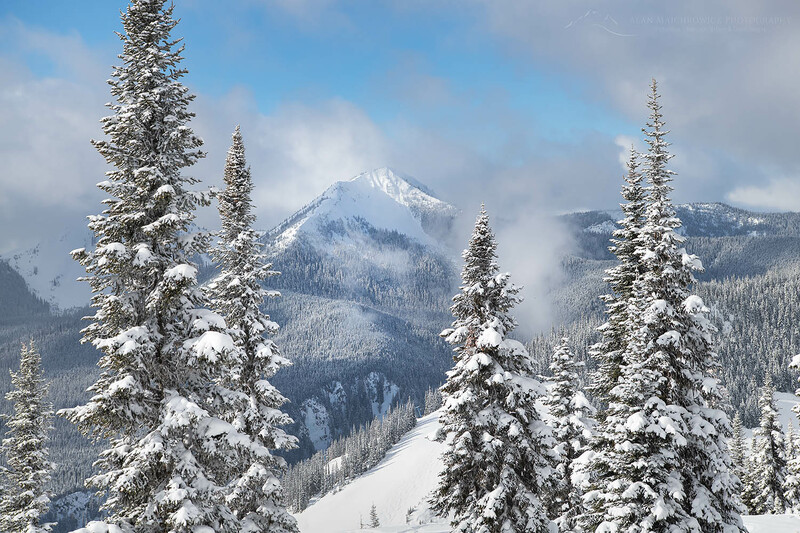 Backcountry skiers and snowshoers can also find fresh snow and solitude on the Fat Dog ski route to the Brothers Mountain group. On this trip I took advantage of both the Nordic trails and downhill ski runs. Manning Park’s Gibson Pass Ski Area offers a bit of a unique experience in the Pacific Northwest. Most ski areas in this region receive a copious amount of heavy wet snow, often referred to as Cascade Concrete. Manning Park, on the other hand, often has colder powdery snow, due to its more inland location. A few of other things sets Manning apart. For one it has a laid back retro feel perfect for families, and avoiding adrenaline junkies. Also, while the big resorts like Whistler Blackcomb charge a staggering $180 (Canadian) for a single lift ticket, Manning charges only $59 (Canadian). 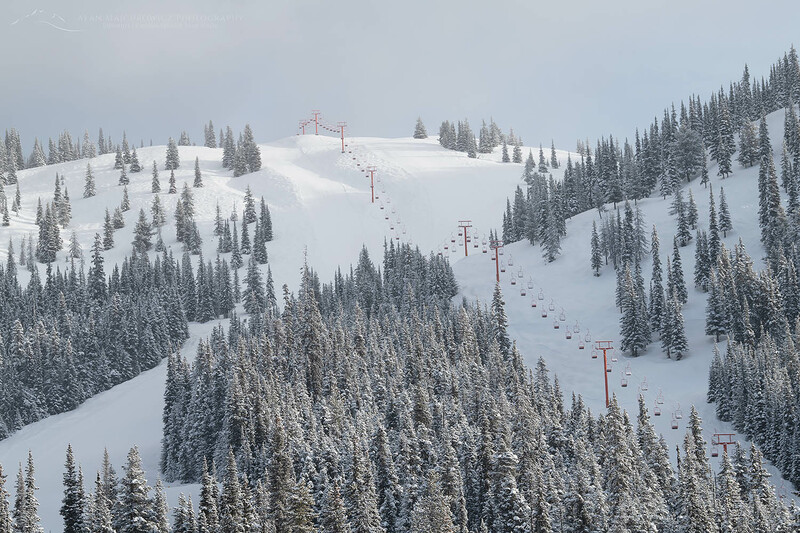 Plus, there are usually no lift lines. On my recent midweek visit, I skied directly onto the chair each time! The downside to these benefits is that there are only two chair lifts, with only one operating in midweek. The vertical drop is a modest 1400′. While the Nordic trails are fun, they usually don’t offer much in the way of landscape photography. Therefore I made a point of taking advantage of the views offered from the top of the ski lifts. From the ridge top the views south into the Washington North Cascades are very good. The two dominant peaks in that direction are Hozomeen Mountain and Castle Peak. Further off west are the jagged peaks of the Mount Spickard, Mox Peaks, and the northern Pickets, in North Cascades National Park. To the north are the rounded summits of Three Brothers and Big Buck Mountains. To photograph the twin summit towers of Hozomeen and the Pickets you’ll want to be on the ridge top early in the morning. However, unless you hike up to the ridge before dawn you’ll be limited by the ski lift schedule. The lifts open at 9:00 so you’ll miss sunrise. Of course depending on lighting and snow conditions you can still make good photos throughout the day. If you want to get to the top only for the views, you can purchase a one trip lift ticket for $10. Later in the afternoon both Castle and Frosty Mountains will begin to receive warmer light. Note that until late spring the north faces of Castle and Hozomeen will be mostly in shadow. 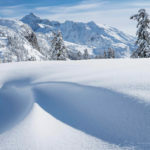 While having great light is always imperative in photography, another important consideration for winter photography is timing the snow conditions. In winter most of the landscape will have a blanket of snow over it. However, trees and forests without snow on them will become black holes for light against all that white. In my opinion and experience the best conditions can be had just after a storm dumps fresh snow on the trees. This sounds simple and obvious, but it can be tricky. 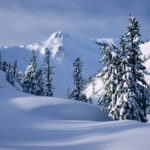 Often in the Northwest a warmer wet snowstorm is followed by sunny conditions, which melts snow off tree branches very quickly. That pristine scene can be gone within a few hours! Colder drier locations such as the Rockies present another dilemma. The snow can be so cold and dry that very little to no snow may adhere to tree branches. Unlike the coastal Northwest where wet snow acts like glue on everything. In cold locations and conditions a slight breeze can also remove the snow as easily as warm sunshine. In the end winter photography can be much more fickle than photographing spring wildflowers or perfect autumn color. Depending on weather patterns where you live or are able to travel to, there may be only a couple of good opportunities a season. So keep a close eye on those forecasts and be ready to go at a moments notice! Driving time to Manning Park is about 4.5 hours north of Seattle, and two hours from Vancouver. Winter camping is available, as are RV hookups at Gibson Pass Ski Area. Manning Park Resort also offers excellent lodge and cabin facilities, along with a restaurant grocery store and gas. Cell phone signal is limited to the immediate lodge area. 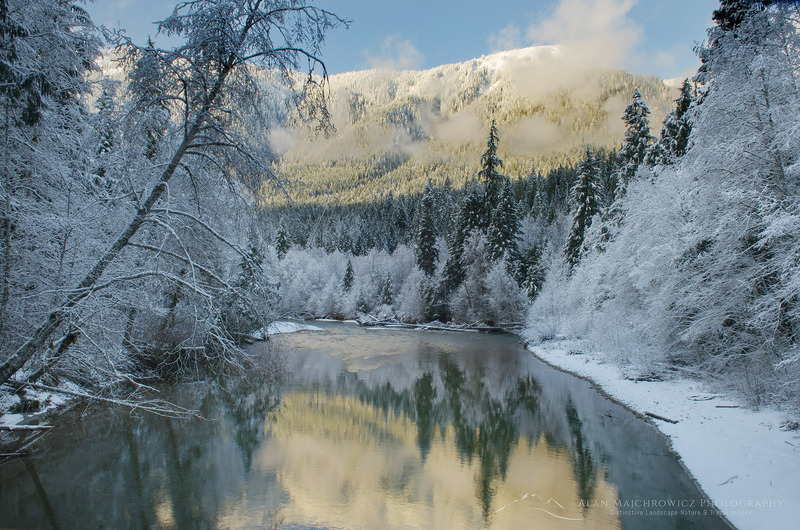 Would you like to learn more about photographing in Manning Park and or winter photography? I offer full day, half day, and multi-day photo tours and instruction. Check out my Private Instruction/Tours page for more info, or contact me directly. I would love to help you take your photography to the next level and shoot like a pro! Heather Meadows Recreation Area is located adjacent to the Mount Baker Wilderness in the North Cascades. Magnificent scenery and numerous hiking trails are the highlights of this special place. 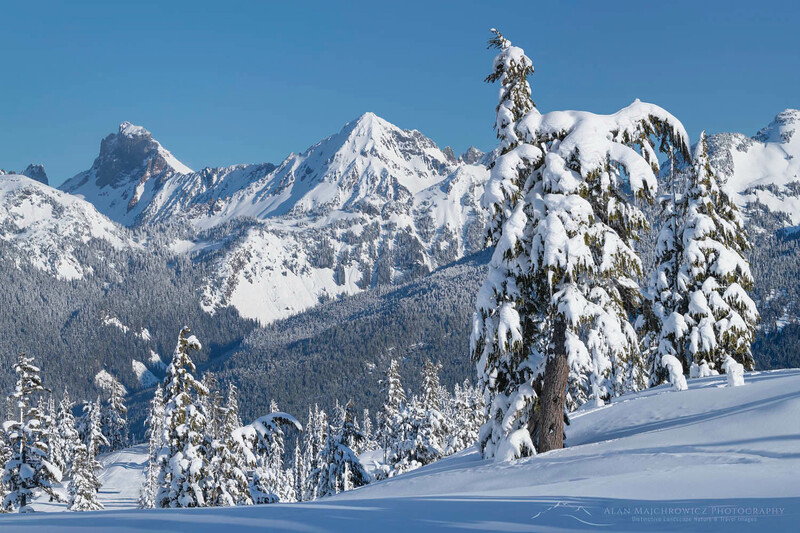 In summer visitors can drive to Artist Point on Kulshan Ridge for incredible views of Mount Baker in one direction, and Mount Shuksan in the other. Further down is one of the most iconic mountain scenes in the world, Mount Shuksan reflected in Picture Lake. In winter Heather Meadows is just as popular a place to visit. 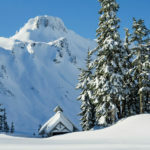 The adjacent Mount Baker Ski Area is open, and throngs of backcountry skiers and snowboarders search for untouched powder. January usually provides some breaks in the winter storms, so it’s a good time to make the trip up. I’ve been visiting Heather Meadows in winter for over twenty years. Mostly for photography but also for the pure exhilaration of the views and crisp cold air. 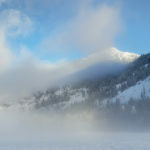 Even though I’ve skied up to Artist Point on Kulshan ridge numerous times I always find something new to photograph. Different lighting conditions and reshaping snow pack will always dress up the scene in a new way. All the photos in this post were made a few weeks ago on a crisp day in late January. 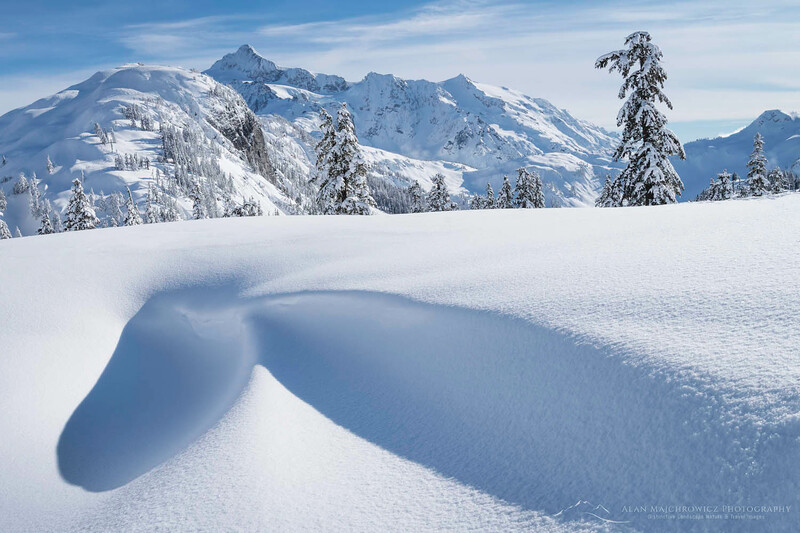 Up near the ridge you can find wonderful shapes and patterns in the ever changing snowdrifts. 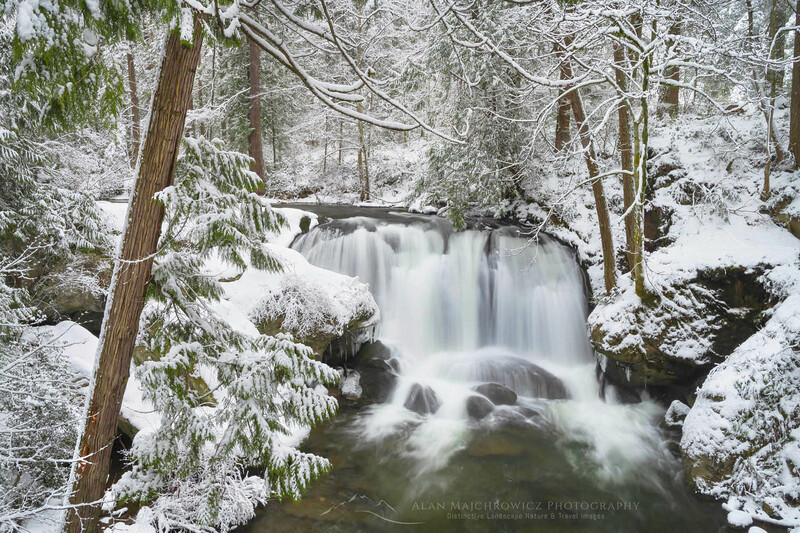 If you are lucky enough to visit just after a heavy storm you’ll also see old growth mountain hemlock trees encased in snow and ice. Also, if you are extraordinarily lucky you may get a glimpse of a steam plume from Mount Baker’s volcanic crater glowing in the evening light! If you go there are a few things to keep in mind. Snowshoes, backcountry skis, or split-board snowboards are the most efficient means of getting around. Skinny cross country skis, or booting it in for even a short distance from the parking lot is exhausting in the deep snow, you’ll be drenched in sweat within minutes. Artist Point is less than two miles and 900′ elevation gain from the parking lot. However, with all your extra winter travel gear that distance can seem much longer. Don’t even think of going during poor weather! Whiteout conditions, heavy wet snow, and increased avalanche danger does not make for an enjoyable outing. It seems every year there a couple of fatalities directly attributed to those types of conditions. 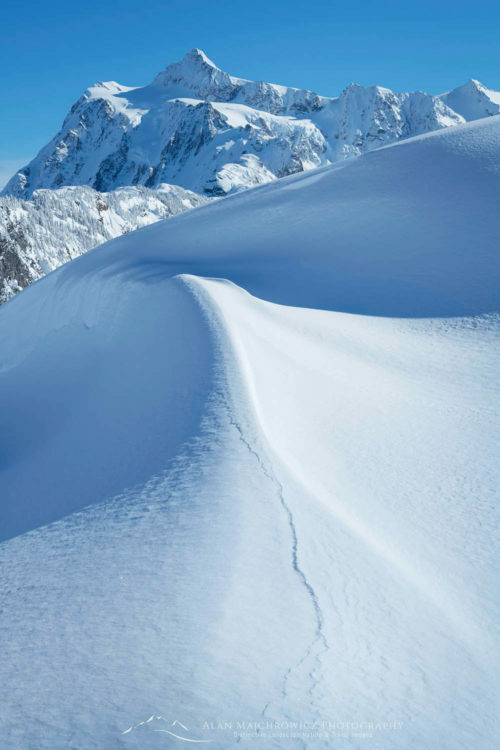 The main route up to Artist Point and Kulshan Ridge is usually safe from avalanches. However, under certain conditions a few areas can be dangerous. Extra warm clothes, it can be windy and much colder on the ridge. Avalanche beacon, probe, shovel, and knowledge of how to use them. 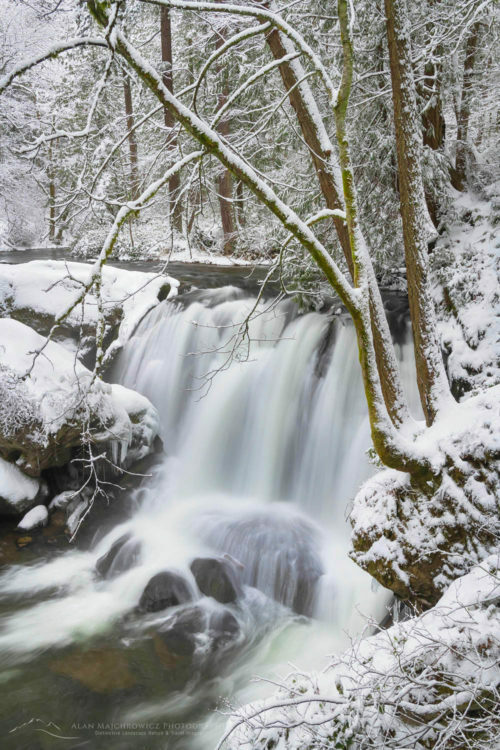 Just like photographing wildflowers in spring or colorful fall foliage, winter photography is all about timing. Maybe even more so. I’m always on the lookout for good conditions. 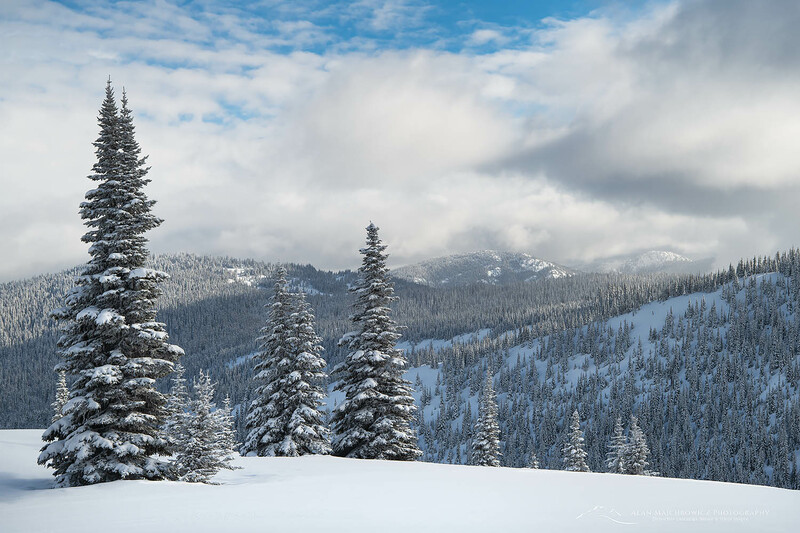 Such as after a good storm covers the trees and peaks in a fresh blanket of snow. Of course it must not be too warm or the snow will quickly melt off the trees and leave them black silhouettes against the white snow. Photographing from Artist Point, Mount Baker is best photographed in the early morning. 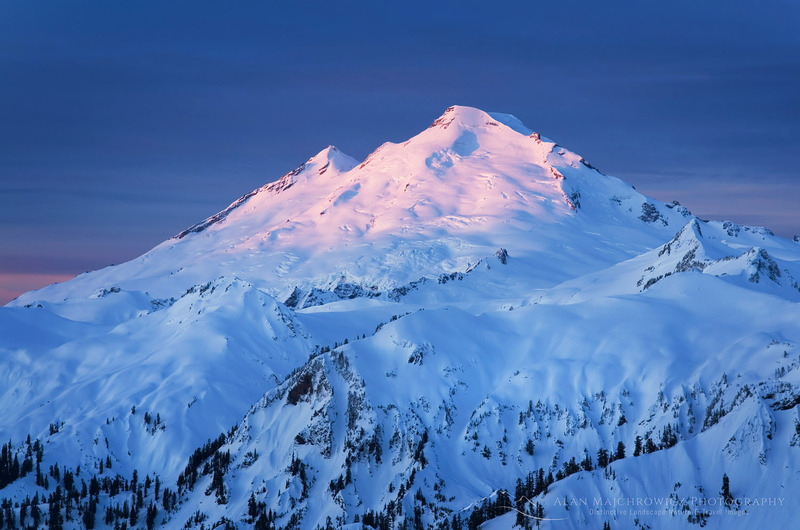 Mount Shuksan is best photographed in late afternoon to evening. For Shuksan late winter or early spring is preferred, since the angle of the sun won’t be as low. You’ll get more light on the glaciers then. For lower down in Heather Meadows morning light can be optimal. Some of the best conditions I’ve seen here are when low clouds or fog are just beginning to lift. 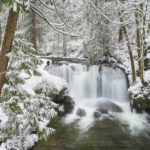 If you are envisioning untouched pristine snow in your photos you’ll have to get there very early, and immediately after a good snowfall. 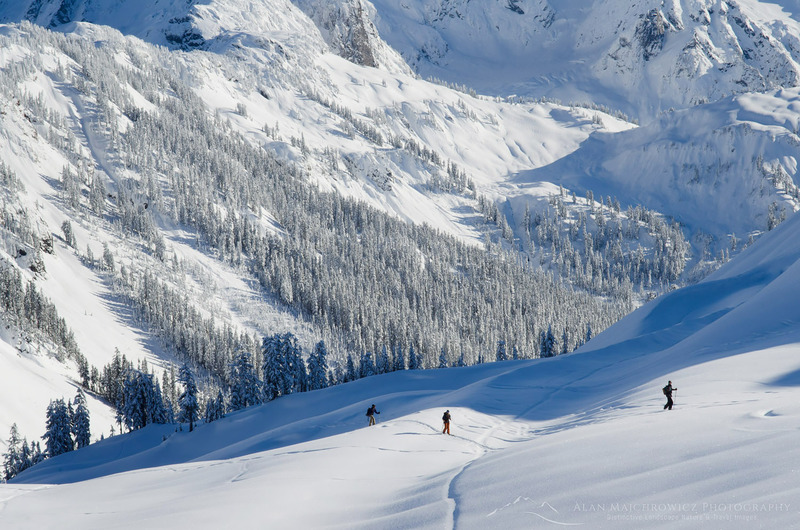 Backcountry skiing and riding has exploded over the years. Therefore, even the most remote and steepest backcountry terrain is tracked out by midmorning. It’s now nearly impossible to make a photo anywhere in the Heather Meadows area without numerous tracks everywhere. Before digital I often trekked the meadows and up to the ridge with a 4×5 large format camera, and all its the weighty accessories. Several times I even did it with a full overnight winter pack! Digital has simplified and lightened the load somewhat. Here are a few basic items I always bring along. Plenty of microfiber lens cleaning clothes, you will drop things in the snow! 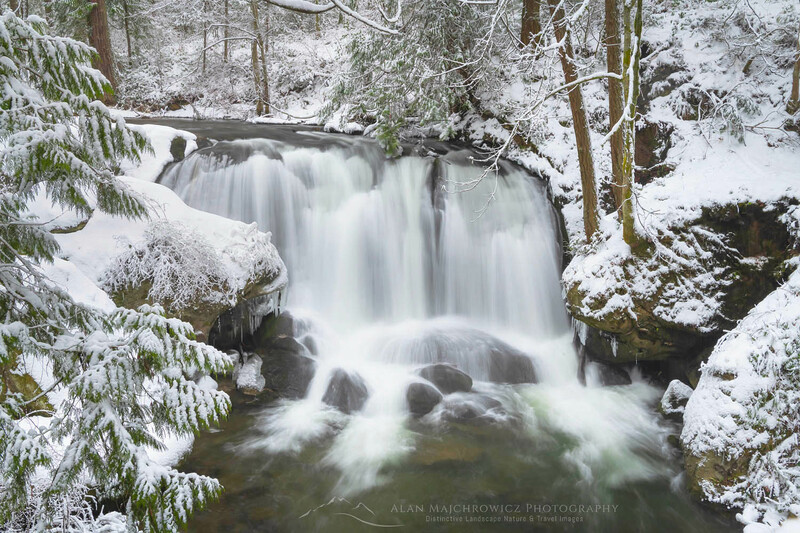 Would you like to learn more about winter photography? I offer full day, half day, and multi-day photo tours and instruction. Check out my Private Instruction/Tours page for more info, or contact me directly. I would love to help you take your photography to the next level and shoot like a pro! Last month I made a quick trip to the Methow Valley in north central Washington for some much needed fresh air exercise and photos. The weather in western Washington had been fairly warm and rainy. 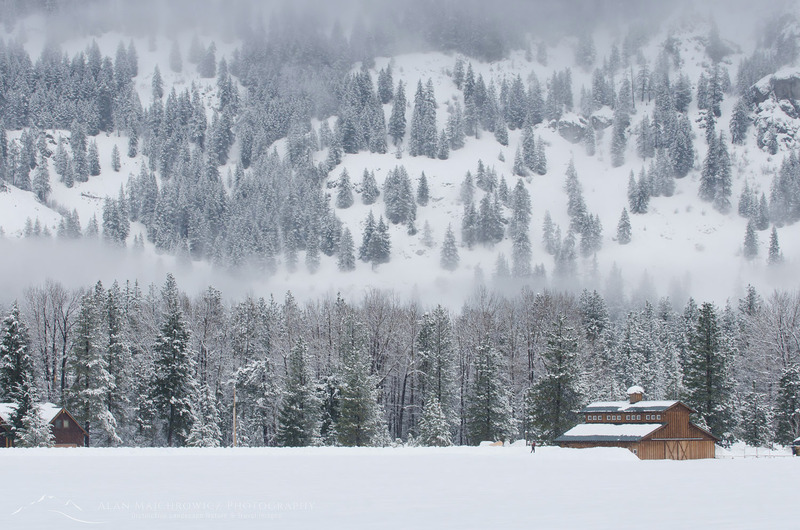 So I headed to the east side of the North Cascades for a quick fix of winter conditions. 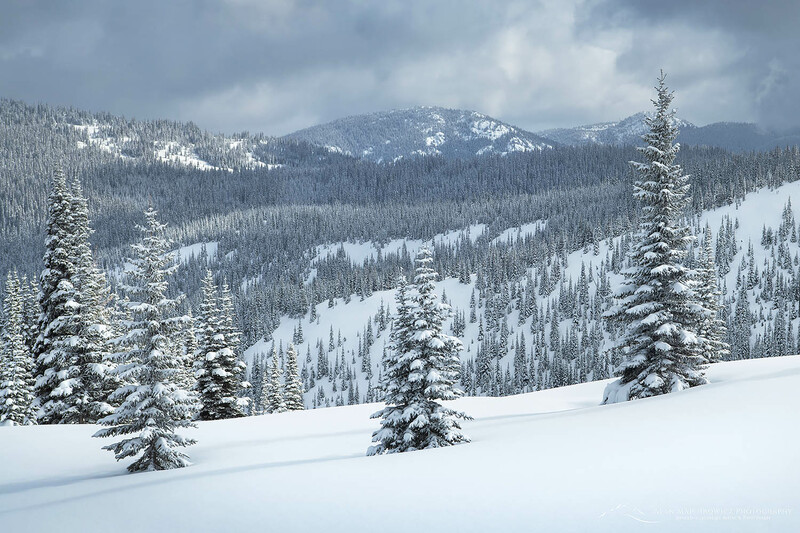 The Methow Valley is renowned for it’s extensive network of perfectly groomed cross-country ski trails and dependable snow cover. The area is also very popular with snowmobilers and backcountry skiers. They accessthe high country via the closed North Cascades Highway. On this trip I stayed in the upper part of the valley near Mazama area where I knew of several good spots for photographing if the light was right. Here are a few of the highlights from this trip. Every winter for nearly twenty years I’ve made at least one visit to Heather Meadows Recreation Area. 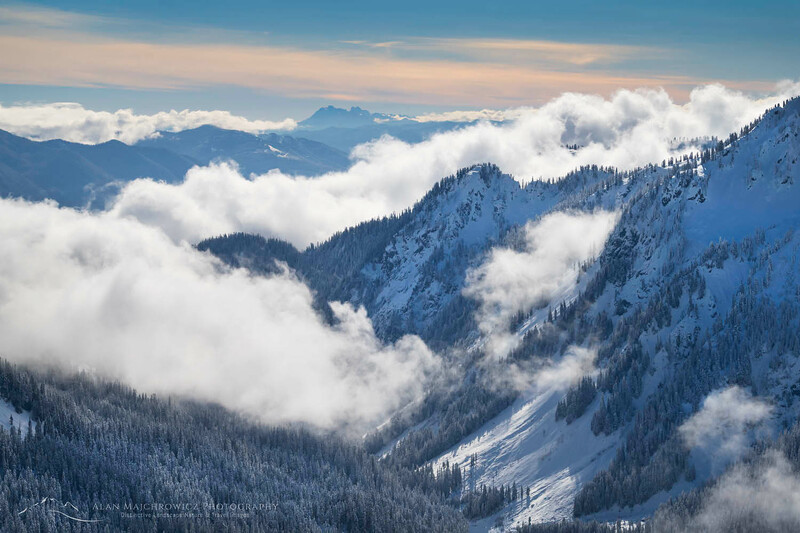 I come here for a variety of reasons, such as being close to home and one of the few places in the North Cascades with relatively easy access to subalpine and alpine terrain. 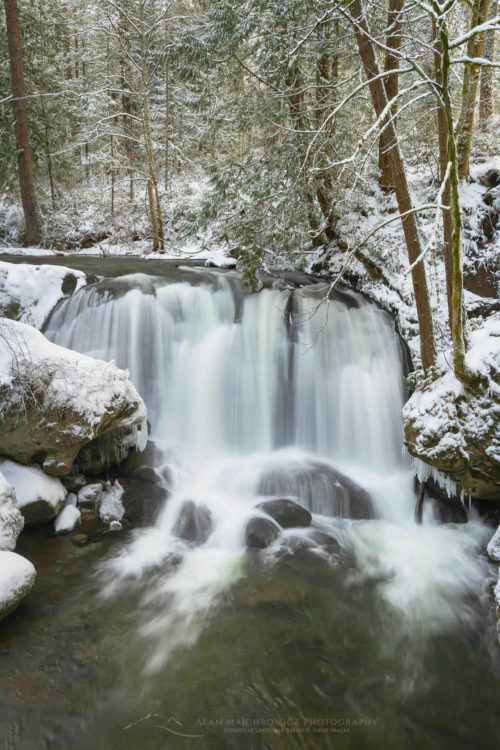 Also because the scenery is some of the best in the state and the ever changing patterns of snow and light make for unique winter photography opportunities. On this first trip of the 2015-2016 winter season I came mainly to begin getting in shape and acclimated for upcoming ski-photo tours. 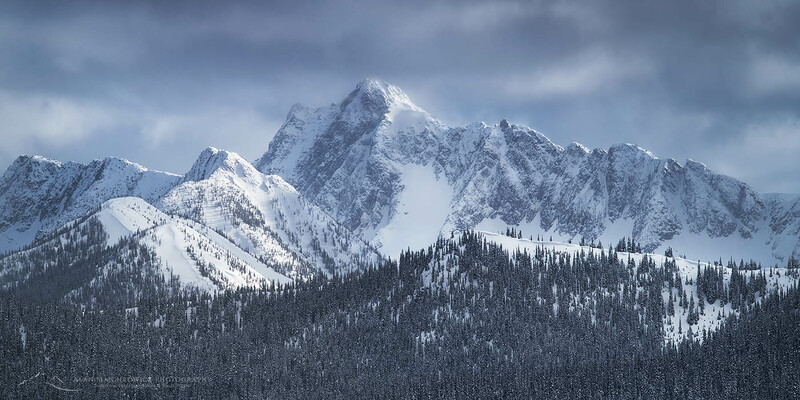 Last year was a near bust as far as snowpack is concerned, but so far this year winter storms have pounded the mountains resulting in a pretty impressive base. 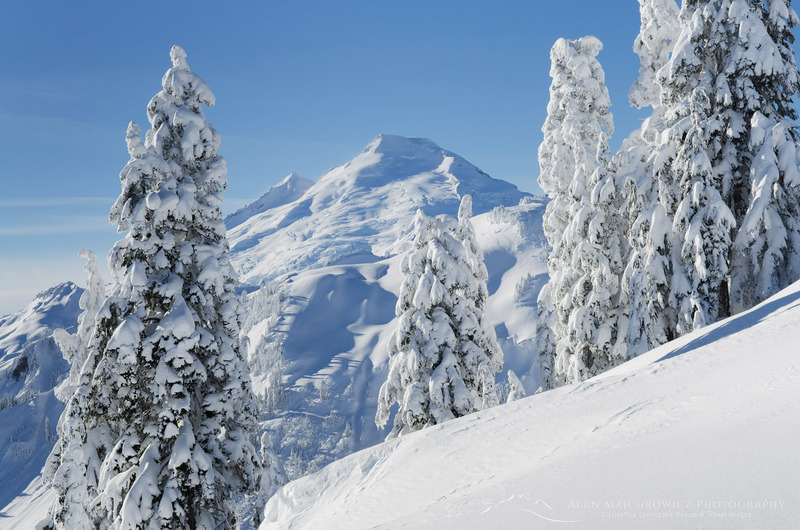 As of this writing the Mount Baker Ski Area reports 146″ in the upper runs, with more storms lined up waiting to dump more snow. The first break in the weather I’ll head back up for a few days of winter camping and photography. 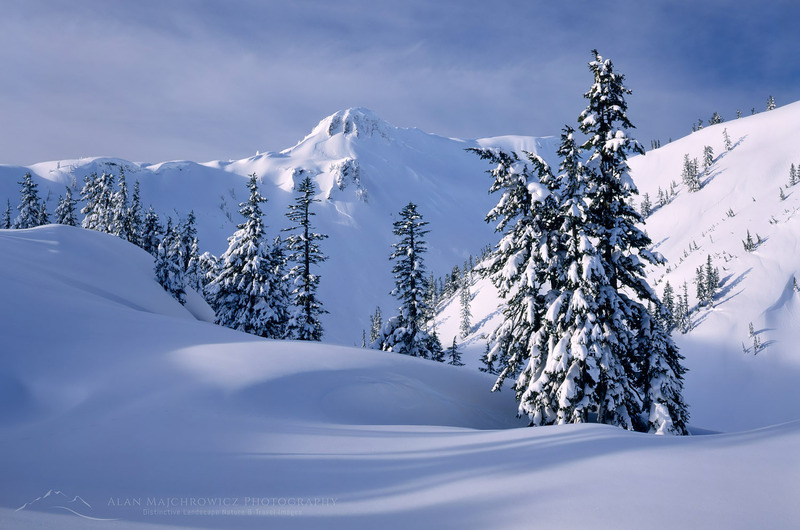 This image of Table Mountain was made near the Mount Baker Ski Area during the record snowfall winter of 1998-99. 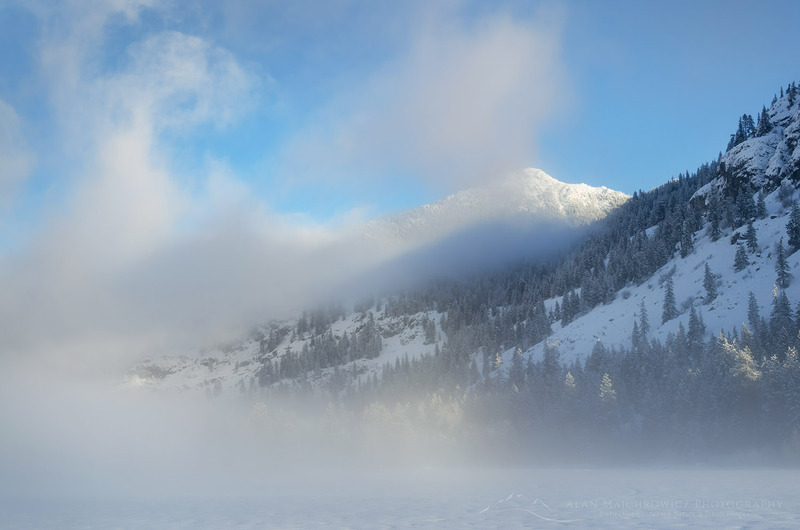 That epic winter the ski area received a whopping 1140″ of snow. I couldn’t find out what the actual base was but it was enough to have people specially hired to dig out the lifts! It should be noted that this total is from November 1, 1998 to May 12, 1999. 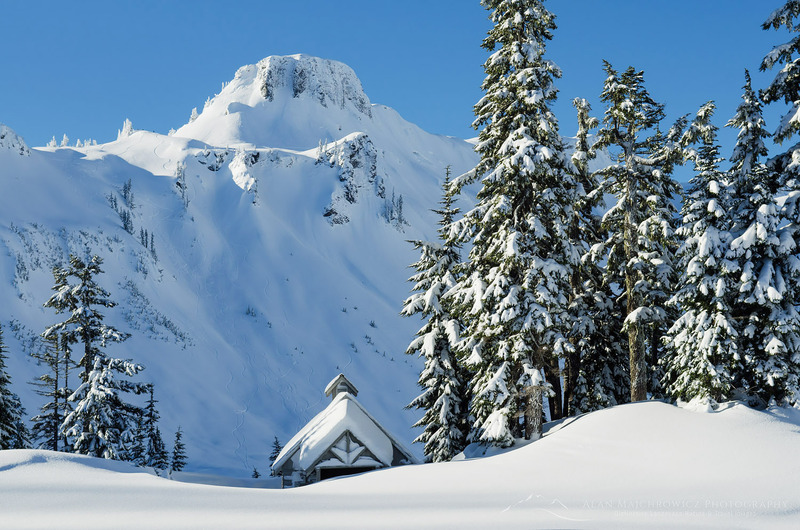 If these statistics aren’t impressive enough you should also be aware that Mount Baker itself, would receive many times the amount of snow than the ski area. No wonder it is perhaps the snowiest glacier cloaked peak in the lower 48 states. Today however is a different story, the record year of 1999 is a distant memory. 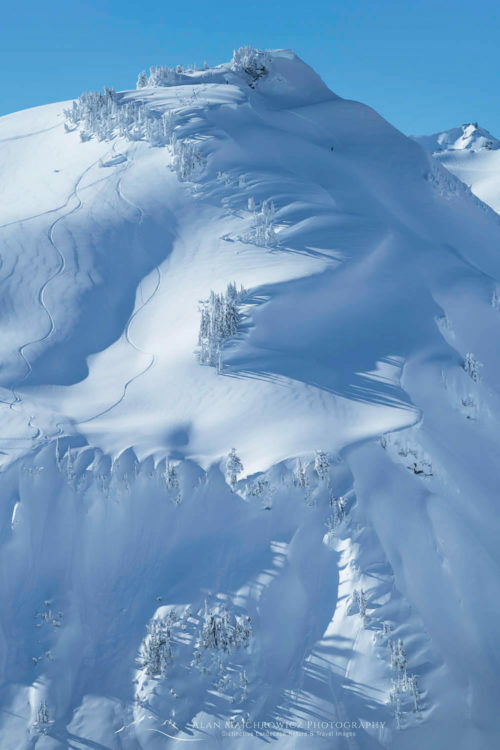 Last winter Northwest ski areas barely managed to keep open for a partial season. Due to unusually warm temperatures and little snow. Since we are still in the grip of that same El Niño weather pattern the forecasts don’t look much better for this winter. But lets be optimistic, it’s only the second week in November. The mountains are already receiving snow from fall storms. Albeit in higher elevations and still a little warmer than normal. In the meantime I’m going to start scheduling some winter photo trips and getting my skis and other gear in shape!